Apart from the bizarre weather of last week, when it snowed in Rome for the first time in 24 years, this winter has been one of the wettest for years. 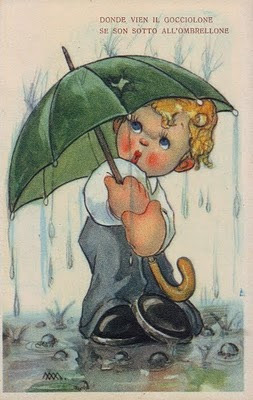 In fact, I woke up this morning to the sound of rain, so I thought this 1942 Italian rainy day postcard issued by Milanese publishing giant Cecami would be a good choice today! The child is wondering from whence the big rain drop is coming even though he is under a big umbrella - “Donde viene il gocciolone, Se son sotto all'ombrellone”! 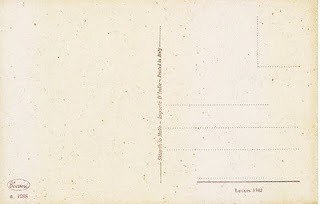 The postcard is uncirculated, but on the reverse the issue date is clearly marked as Luglio (July) 1942 and it bears the distinctive Cecami logo which is still in use today. I'm not usually a big fan of the overly cute in vintage postcards, but this card has such a beautiful range of colours and printing finish that I couldn't resist it. The printed area has a matte finish with a slight dull sheen if tilted to the light and the details of the crayoned drawing make it almost appear hand-drawn at very first glance, which makes me think some kind of lithographic printing method was used. Whilst the initials M.M. - the only clue to the illustrator behind this artist signed postcard - appear on many Italian comic or humorous postcards of those years, I've been unable to discover anything more about the artist. I imagine that he or she probably worked in-house for Cecami – as always, if anybody has any further information then do drop me a line in the comments below. We've had tons of rain in Northern California this year too - needed it desperately as we were heading into a big drought otherwise. Cute card. I agree; I often don't like the overly cute cards either, but this one has a certain style that I really enjoy. I'm with you on cute cards but I like this one, perhaps because I'm from a rainy part of the world. That rain really looks wet. It's an attractive card and as you say, not overly cute. This winter has been one to remember! Has a little bit of Hummel vibe going on. I'm wondering if that was the artist's influence. Great card. We've had an unusual winter as well. I found an umbrella today with fur trim on it, go figure. Lovely postcard. We could have done with a much bigger umbrella today. I had forgotten I'd added this lovely postcard to my current "cyber" collection! I will add a link so people can read about this. Thank you so much!